There are close to 100 different Virginia wineries spanning the entire state. The small state of Virginia actually has a long wine-making history, beginning in the early 1600's. Wine makers spent hundreds of years attempting to grow and cultivate French grapes without much success. Finally making headway after the Civil War, Virginia wineries were finding a measure of success until Prohibition came along and the industry languished. In the 1960's Virginia began experiencing successes in the wine industry and is now considered a top producing wine state in the United States. Northern Virginia - This region is located near Washington D.C.
Central Virginia - This area is also located close to Washington D.C. but has fewer wineries compared to the Northern Region. Eastern Virginia - Farther away from Washington D.C. but within a short driving distance, this area has a smaller population than other areas closer to D.C. so it has a more "country" feel to it. Shenandoah Region - Several hours from the airport, the wineries in this area offer the beautiful scenery and landscape of the Shenandoah Valley. Southwestern Virginia - The wineries in this region are surrounded by the Blue Ridge Mountains. Virginia wineries welcome an estimated 500,000 visitors a year. If you are thinking about taking a tour, here is a list of wineries by region. Corcoran Vineyards - This winery offers tastings of their many different award winning wines including: Meritage, Cabernet Franc,Viognier and Chardonnay. Linden Vineyards - Making only 5,000 cases of wine a year, Linden wines and winemaker/owner Jim Law are both well respected throughout the wine community. Gray Ghost Vineyards - Another award winning Virginia winery, Gray Ghost Vineyards offers tours and special "Winemakers Dinners." Keswick Vineyards - This vineyard is located on the historic Edgewood Estate in Keswick, Virginia. This 400 acre estate offers amazing views of the Southwest Mountains as a backdrop. Stone Mountain Vineyards - If you are looking for breathtaking views, Stone Mountain Vineyards is the place for you. It is located on top of the Blue Ridge Mountains. First Colony Winery - This relatively new winery won numerous awards with their first vintage in 2002. Williamsburg Winery - This is Virginia's largest winery, producing over 60,000 cases of wine per year. Lake Anna Winery - This small winery has produced a number of award winning wines and is family owned and operated. James River Cellars - The annual April Fool's Wine Festival is held at James River Wine Cellars every year in a celebration of the coming Spring season. White Rock Wines - Enjoy White Rocks' selection of wines in their Tasting Room Bistro. Valhalla Vineyards - This winery offers spectacular views of the Blue Ridge Mountains. 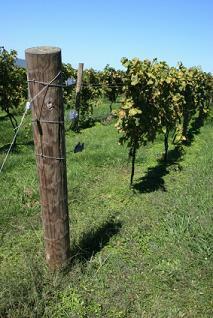 Westwind Farm Vineyard - This small winery has the intimate feel of a family farm. Chateau Morrisette - Along with Williamsburg Winery, Chateau Morrisette is also one of Virginia's largest wineries. Fincastle Vineyard - Located in the Great Valley of the Blue Ridge Mountains, Fincastle Vineyard offers many special events throughout the summer like "Jazz at the Winery" and the "Botetourt Wine Trail Concert Series." North Mountain Vineyard - This winery offers Chardonnay, Riesling, Chambourcin, Claret and Blush among other special winery blends. Shenandoah Vineyards - Along with Chardonnay, Merlot and Pinot Noir, Shenandoah Vineyards offers an Aperitif wine called Raspberry Serenade. Virginia wineries offer wine lovers an alternative to visiting California wineries, especially for those who live on the East coast of the country. The next time you are thinking about planning a wine tour vacation, consider traveling to Virginia to take a tour of their numerous wineries and enjoy the amazing scenery the state has to offer.